Hi all! 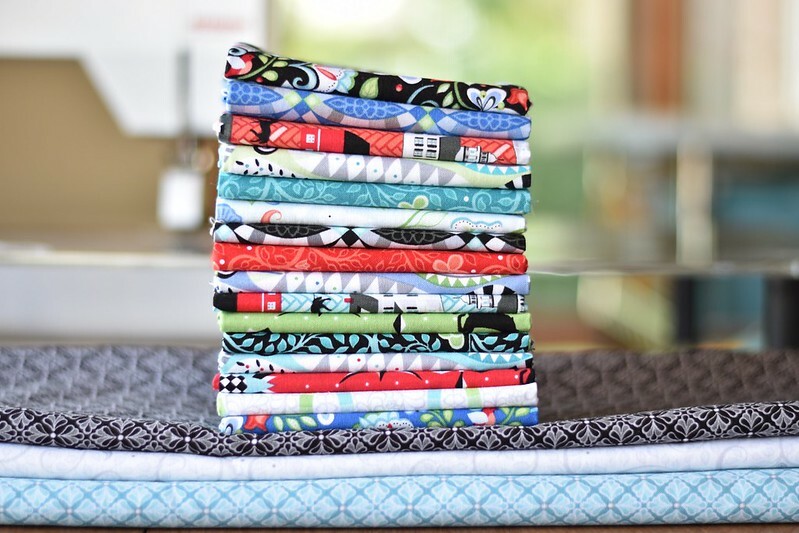 Today is my stop on the Folk Art Fantasy Blog Hop featuring Amanda Murphy‘s latest line for Benartex Fabrics. I was immediately drawn to Amanda’s booth at quilt market in May. Below is a photo I snapped. I think it was the colors that drew me in (and probably that amazing medallion quilt!). I also adore the quilt hanging on the left with the cute houses and red barns (another weakness of mine). So, when this pretty stack arrived two weeks ago, I couldn’t wait to cut into it. The end result is my latest quilt design, Kaleidoscope Windows. I’ve had this quilt design sketched up for a couple of years and it was fun to finally put it into fabric. Isn’t it pretty hanging in the tree? The below photo shows off the pretty Folk Art Fantasy fabrics. This line even includes a fantastic low volume print that works perfectly as a background. The quilt finishes at 62″ square and below is all of the information you need to make your own. 1. Layer one print 8″ square and one background 8″ square RST. 2. Pin in place and draw two diagonal lines from corner to corner on the back of the background square. 3. Stitch 1/4″ on each side of the diagonal lines. 4. Using your ruler, cut a vertical line at 4″ through the center. 5. Without moving the fabric, move the ruler and cut a horizontal line at 4″ through the center. 6. Again, without moving the fabric, move the ruler and cut directly on each of the diagonal lines. 7. Once all cuts are made, you will have a total of 8 matching half square triangles (HSTs). Press away from the background fabric and trim each HST to measure 3 1/2″ square. 8. Select 8 HSTs of two different prints for a total of 16 HSTs. Lay them out according to the block diagram below and sew them into rows pressing the seams open. Then sew the rows together into a block. The completed block will measure 12 1/2″. 9. Repeat to create a total of 16 completed blocks. 10. Lay out your blocks, sashing and cornerstones as shown in the quilt layout diagram below. Sew the sashing rows and block rows together and press the seams open. Sew all of the rows together. 11. After the center of the quilt top is pieced, use your 3 1/2″ x WOF strips to piece together two 56″ x 3 1/2″ border strips for the top and bottom and two 62″ x 3 1/2″ border strips together for the sides. Sew the top and bottom borders onto the quilt followed by the side borders. 12. Once quilted, piece together seven 2 1/2″ x WOF strips end to end to create your binding. Now that I see the completed quilt diagram above, I really want to make one with only 4 fabrics! Here’s the best part – Benartex is giving away a fat quarter bundle of Folk Art Fantasy to one of my lucky readers!! Leave a comment for a chance to win and I’ll pick a winner by July 4th. To see some more super cute items made with Folk Art Fantasy (and additional chances to win!) check out the line up below. Thanks so much for stopping by and if you make your own Kaleidoscope Windows quilt, I’d love to see it! Where can I buy the fabrics in Amanda Kaleidoscope window quilt. It’s so beautiful. Oh I really really like this and I’m going to add it to my “to do” list. So beautiful and easy too!! It’s amazing how versatile the hst is. Beautiful quilt. Love it! Adding to my long to do list! I love that your instructions are so easy to follow! The Folk Art Fantasy fabrics would be so much fun to play with. Red, White, and Blue colorways always have my heart! Love the soft suttle colors of the fabric. They each blend so well in your quilt. Thank you for the detailed easy directions. Your quilt is festive and fun. And I have a bunch of HSTs begging to copy it. Thanks for the tutorial. This is beautiful. I can’t wait to see it in 4 fabrics!!! Your fabric line is gorgeous as is your quilt. Ant wait to find the fabrics in my lqs! So beautiful! I really want to make one too! I want to make this one too!! This looks like a perfect summer quilt, and the fabric is lovely. Love the quilt. Thanks for the pattern. Wow, it is just gorgeous! Wonderful way to use these lovely fabrics. Your design of Kaleidoscope Windows is the perfect pattern for the Folk Art Fantasy fabric collection! I’m glad you were able to use them together. Some things were just meant to be, right? I’d love to make one just like it! Gorgeous quilt! I definitely have to try making my HST this way! I am new to your blog. Thank you so much for sharing your beautiful quilt with us. The Folk Art Fantasy fabrics are delightful. Your pattern shows them all off well. I would love to make your pattern with those fabrics and then make another to do some stash busting. such a lovely fabric line. your quilt is gorgeous. i like how you highlighted the fabrics. Oh wow!!! I love the design of this quilt and that fabric collection is perfect!!! I am truly inspired and would love to make a similar quilt for my daughter!!! Such a pretty quilt. Love the way the lightness of the center draws ones eye into the block. Love the blenders in this fabric line. Beautiful. It looks so cheerful for the summer. Thanks for sharing the pattern, I love HST’s and this would be perfect for a leader/ender project. I just yesterday picked up my copy of Folk Art Lane and can’t wait to get started on it. Beautiful! Like the quickie method of making 8 HSTs at a time. Thanks for the great tutorial! I love the way that these fabrics play together. Thank you Amanda for the tutorial maybe I could even attempt to make this one. Your quilt is so attractive with your pretty collection of fabrics and I like the four colored one as well. Happy 4th of July! I can’t wait to get started on this quilt pattern! It’s a perfect summer picnic quilt. Your quilt is so beautiful Amanda! Thank you for sharing and for the tutorial. Beautiful quilt and layout. The tutorial is great with easy to follow instructions. Beautiful quilt! I have been looking for a pattern for some fabrics I have, to make myself a quilt. I think this is it, thank you! Love the Folk Art Fantasy fabrics too! Your quilt is beautiful! I would love to make your quilt in solids, too. I think it would look different, but beautiful as well. Thanks for the pattern and chance to win. Love your quilt. It makes good use of a very pretty bundle. 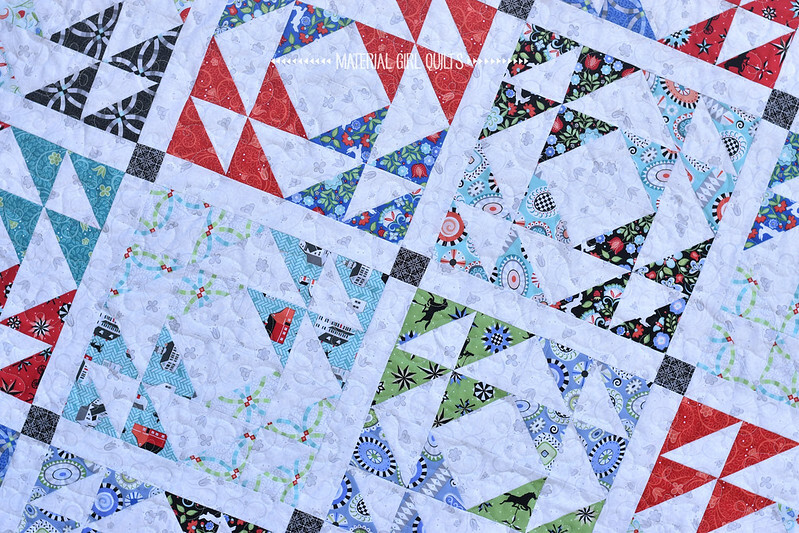 The Folk Art Fantasy fabrics make this quilt fresh and lively! Adding it to my to-do list! 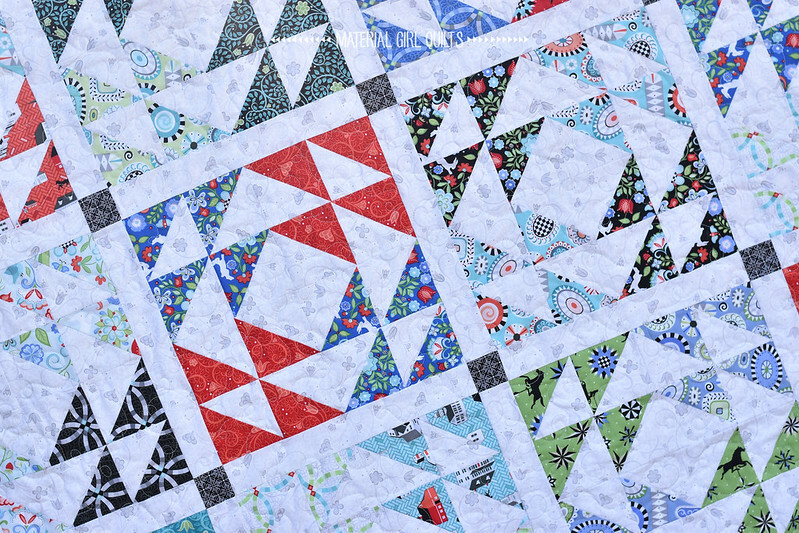 What a pretty quilt, and a slick trick for making HSTs! I think it would be neat made in dark solids for my son. Thank you for the tutorial. The quilt is great. I seem to be drawn to patterns with triangular shapes. It has actually become a joke with my quilting buddy. Can’t wait to do something with this line of fabric. Awww Thank you so much for the tutorial. I love your quilt. It is beautiful. Great fabric and pattern. Thanks for the tutorial. You blended these fabrics so beautifully together, gorgeous quilt!! Thank you for the pattern! Gorgeous quilt! Love your quilt! Thanks for the great tutorial! I love how the neutral fabric is pretending to take center stage. Very nice quilt. Thanks for the pattern. It’s just fantastic and love how you play with the fabrics. Your quilt is gotgrltd! Love the fabrics. Love the fabric and your quilt. Super quilt and I really love the that fabric collection!! I love your quilt – thank you for the pattern! Oh, I am seeing that pattern in some autumn colors!! Which are plentiful in my stash. Thanks for the tut! 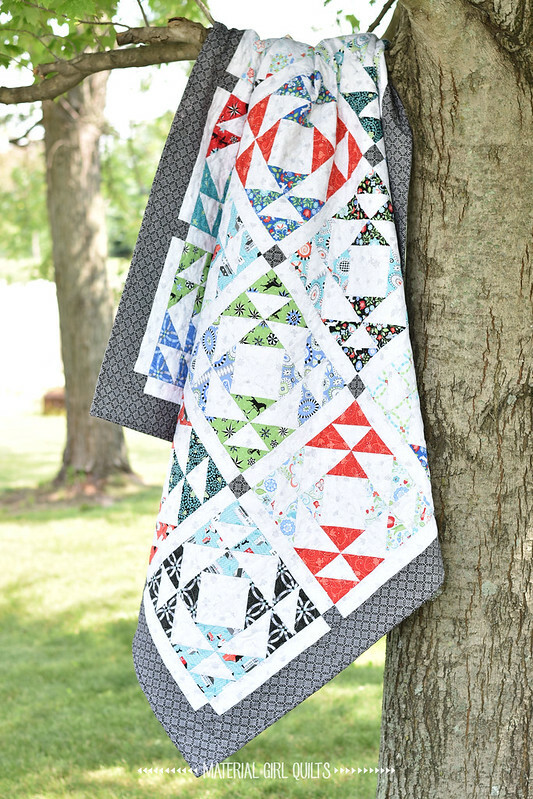 I LOVE this quilt and if I won the Fat Quarter bundle, I could make 2! Oh happy day! Love the design of this quilt. Fabrics are so summery. Thanks for sharing your talents. I really love this quilt, it just looks so clean and bright. I will surely be making one of these, soon. This quilt is beautiful; love the design and the way the fabrics work in it. This collection is so gorgeous. Your quilt is lovely! Thanks for the tutorial! I love the quilt! Isn’t it fun how a design can sit and “ripen” until the right fabric comes along? I’ve had that happen before! Your quilt using these fabrics is beautiful! Lovely. I really enjoy nature pictures with quilts. They are so pretty and remind me of when we used to have a farm. Nice quilt! Great for the 4th! I really like the fabric line and this pattern! Thank you soooo much for sharing your Tutorial!! Looove your quilt!! & these Fabrics are perfect for it! Beautiful job!! I love your quilt and I like the diamonds white fabric from the collection used as background. I think a four color quilt would be stunning. LOVE this fabric & your quilt!! So simple yet it makes a beautiful quilt. Thank you for sharing your pattern. It is lovely! Beautiful quilt and fabric! I’m going to try your method for 8 HST at once – looks so simple and such a time saver! This quilt is one of the prettiest I have seen. Thanks for sharing it! I love all of Amanda’s fabrics but Folk Art Fantasy has me by the heartstrings. 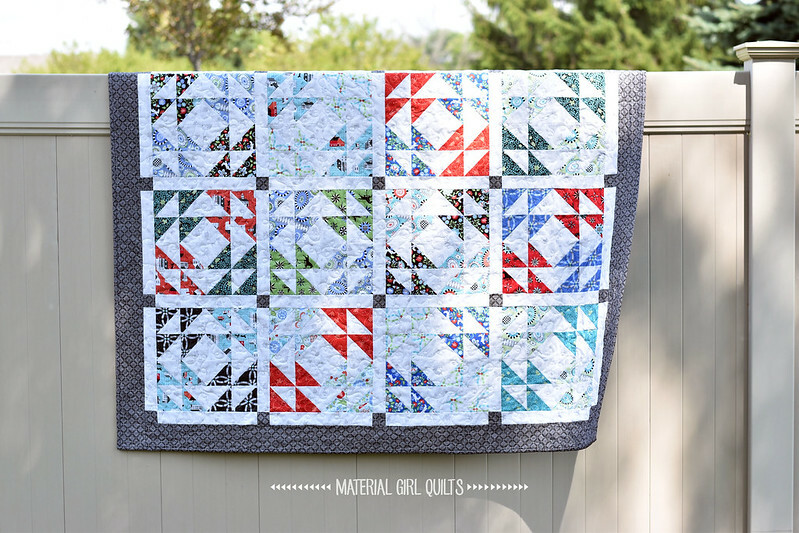 I love this quilt because it showcases each of the fabrics so well! Thank you for sharing and I hope to win that FQ bundle!! Did you have to sliver trim the HST? I think this pattern would be great in scrappy fabrics too, the way you arranged the colours is unexpected and gives a great secondary colour flow. Hi Lisa, I forgot to add that step (and have now updated the post). Yes you will need to trim your HSTs to 3 1/2″ square. Thanks!! The quilt is fabulous, and I love the fabric, too. I use this method for making HSTs all the time. It’s so quick and much better than sewing bias edges. Thanks for sharing! This is such “happy” material, it brings a smile to my face! Beautiful quilt and the instructions were straight forward!! Thank you for sharing! Another future project! Wow!! I’m in love with this quilt! I just may have to make this quilt! Absolutely love the fabrics….and the pattern! I love your quilt pattern. It is so versatile and would look beautiful in so many different fabric designs. How about Christmas fabric or Halloween fabric, or fall, winter, summer, or spring themes, or a child’s quilt. It would even look great scrappy. The Folk Art fabric is so pretty. Love the colors. Gorgeous quilt and thank you for the tutorial. I guess I’ll be adding it to my list of “must makes”! What a pretty quilt! Thanks for the clear tutorial! Gorgeous quilt, thank you for your tutorial! Love the colors, Thank you for the pattern. 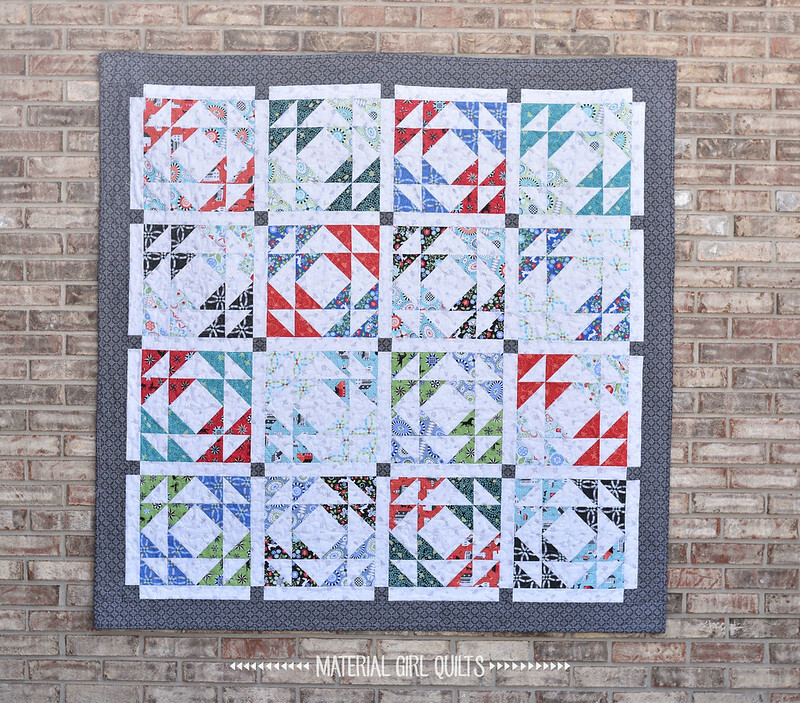 Where can the medallion quilt patter be purchased? This is a great quilt. Would love to do one in the fabric like yours. Love your quilt designs. This one especially appeals to me. Absolutely beautiful. I love this! I also have a weakness for houses & barns! Absolutely love HST. Lovely quilt! Love your quilt and tutorial! Great quilt & tutorial. Thanks! I really loved the quilt and your directions are clear even for a novice like me, but I’d really like to win the fabric so I can actually make it. Another beautiful quilt of yours. Thanks for the instructions! The fabric is absolutely perfect!